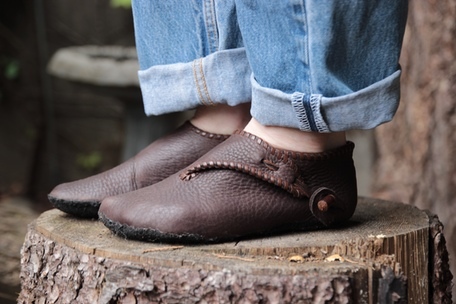 Village Video is excited to announce a partnership with Laughingcrowe school of non-lasted shoemaking to bring you a Scandinavian Turnshoe instructional video. 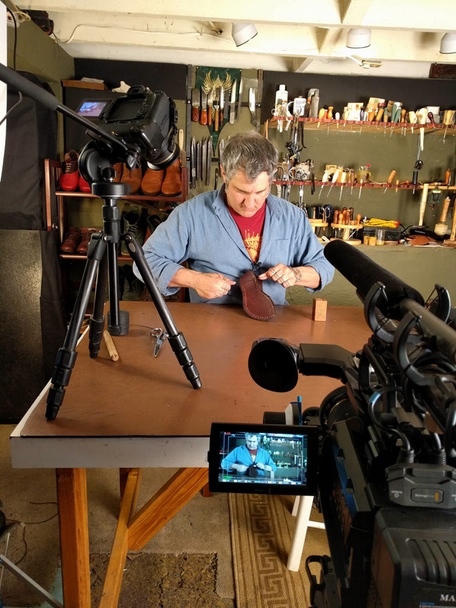 In this video, shoemaker Jason Hovatter teaches you how to build a pair of Scandinavian turnshoes from the ground up. Beginning with a duct tape casting of the foot, he walks you step by step through his process of non-lasted turnshoe making. Learn to make a pair of truly custom shoes tailored to your unique feet! Over 4 1/2 hours of video, animations, and detailed instructions. These shoes can be made with three specialized tools. The curved bladed awl is a curved awl that is sharpened. The hand stitcher is a McKay stitcher needle mounted in a handle. 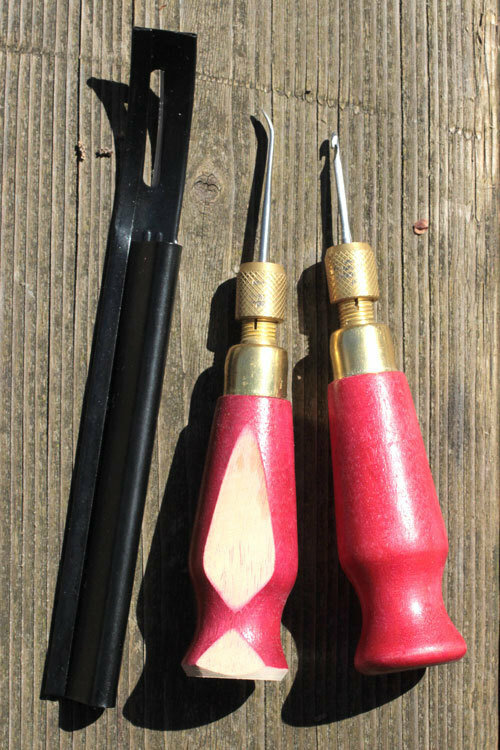 The skive is a common leather working tool. You can purchase and improvise these yourself, or buy a bundle of these tools with the tire dust for your soles, prepared by Laughingcrowe, in our store. We cover how to improvise the rest of the tools in the video, like how to modify a kitchen fork to make a stitch groover. 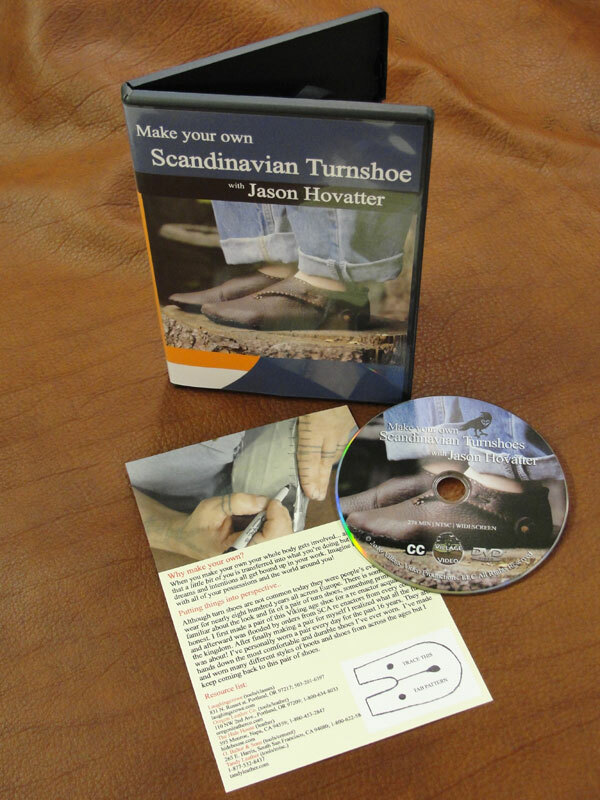 Scandinavian Turnshoe - Make your own! from Village Video on Vimeo. My husband got this video through Kickstarter, and I'm blown away by the quality of both the instruction and the video production. About the instruction: Not only does Jason Hovatter break down every step, he demonstrates the difference between techniques that will create success when done right, or failure when done wrong. Each part seems daunting at the beginning, then intriguing, then possible, as you watch the shoes get created. He builds student confidence through his no-nonsense demeanor. About the video: Each major chunk of work is introduced with stop-motion animation, so you can literally see what will happen with the shoe in this part. Then every technique, from pattern making to stitching, is shot from angles and framed so that the viewer always knows what they're looking at, and can re-create it in front of their own eyes. When there are new techniques to learn, the video shows diagrams that show the correct angle to skive, or to pierce the stitching holes, or to lock-stitch the thread. My mother and I followed these videos to make our own shoes over the course of a week and a half, using afternoons when I came home from work. It was difficult--especially the turning!--but not only are we thrilled with our shoes, we're already planning our next ones. Let me be clear: I was a classroom teacher for 9 years. I have a masters' degree in curriculum and instruction. I'm professionally critical about instruction, pedagogy, and method, and I have never seen finer video instruction. This is a beautifully produced video and the instructor really knows his stuff. I haven't made my first pair of turnshoes yet, but I have gathered all the tools and materials and will start soon. I am confident that I will be able to make a perfectly fitting pair of turnshoes because Jason's teaching is so clear and so enjoyable to watch. I highly recommend this DVD! If you need help retrieving your pre-order streaming code click here.